Singapore news today | UPDATED - [FUNNY] 21-YEAR OLD CROSS-DRESSER CAUGHT IN ITE WEST FOR PEEPING IN GIRLS TOILET! 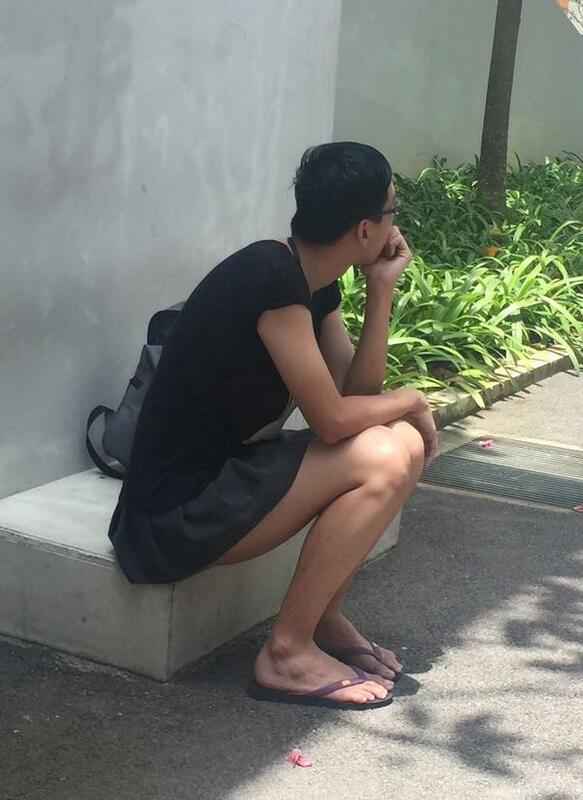 UPDATED - [FUNNY] 21-YEAR OLD CROSS-DRESSER CAUGHT IN ITE WEST FOR PEEPING IN GIRLS TOILET! UPDATE @ 03 March 15 14:45 PM: We were informed that there is a video of the encounter. The video is appended at the end of this post. According to Twitter user Norrick Nolesta (@Noyyick), a 21-year old man who was dressed in woman's clothing and wore a wig was caught for trying to peep Norrick's female friend in a girls toilet. Norrick shared that the man was trembling when he was being questioned by the Police. The photos of the cross-dresser were circulated by netizens on popular Hardwarezone.com forums. Netizens identified the location as ITE West where the alleged offence was committed. Most were in disbelief when they saw the photos. However, some commended the cross-dresser's efforts to dress well and kept his legs shaved.